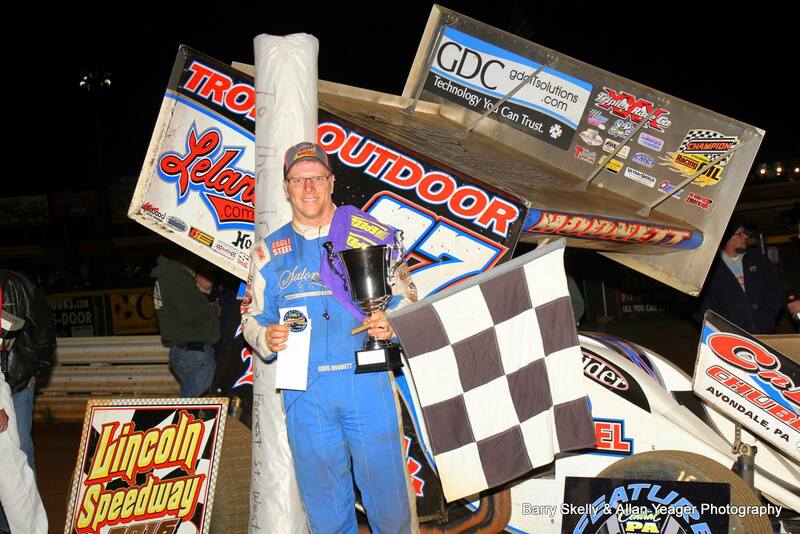 ABBOTTSTOWN, PA 5/14/2016 – Central Pennsylvania “410” sprint car points leader Greg Hodnett took advantage of a unique qualifying format to advance nine spots before the race event started and score the win in the 25-lap BAPS Night feature at Lincoln Speedway Saturday night. Hodnett advanced from a handicapped 11th starting spot to second after winning a series of match races for the top 12 qualifiers. His only loss was to polesitter Stevie Smith when he ran out of fuel in the final match race. “Yes, we did run out of fuel on the last match race,” confirmed Hodnett upon exiting the Mike Heffner Lelands.com/Trone Outdoor Adverting #27 in victory lane, “We just didn’t think we’d make it that far (through the challenge races), and we had 20 gallons in it. We ran 20 or 25 laps and it just wasn’t enough. Despite losing to Smith in the final match race, Hodnett still started beside him for the start of the feature. Smith grabbed the lead at the outset and had a 1.72-second lead when he and Hodnett entered lapped traffic at the mid-point of the race. Hodnett made the race-winning pass on lap 16, crossing .72 seconds ahead of Smith at the finish. Hodnett’s $5,000 payday (including $1,800 from BAPS) was the 31st of his Lincoln career, moving him into sole possession of 10th on the all-time Lincoln win list. Third through fifth were Chase Dietz, seventh-starting Billy Dietrich, and eighth-starting Alan Krimes. Completing the top ten were Gerard McIntyre, Jr., Brent Marks, Freddie Rahmer, Steve Owings, and Robbie Kendall. “Thanks to everybody for being here tonight. I know it was very questionable weather, but we really appreciate everyone coming out. Thankfully, we got the race in. We were debating on whether or not to come up…if they’d even be able to try. But Fred Putney always does a great job with the track under any circumstances, and he came through for us tonight and made it happen. Heats for the 33 410 sprinters on hand were won by Brian Montieth, Freddie Rahmer, Marks, and Owings, with Lucas Wolfe winning the consolation. Tim Glatfelter was transported to the hospital for a check-up after flipping hard on the front stretch during his heat. Car owner John Trone said that Glatfelter sustained a possible concussion and arm injury in the crash. York’s Dalton Dietrich scored his first career win in the 20-lap ”358” sprint car feature. Dietrich started outside polesitter Chris Frank, grabbed the lead entering the first turn, and led every lap. 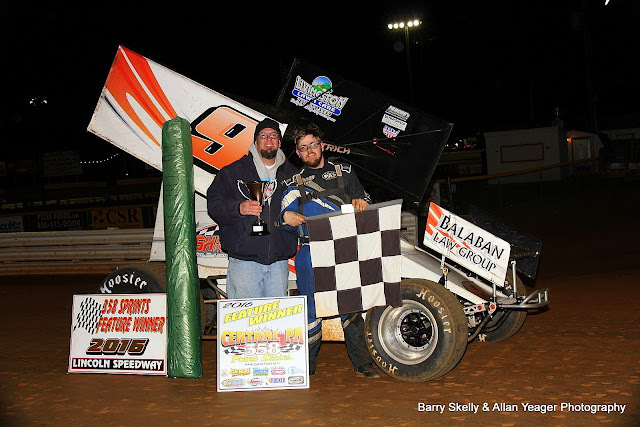 Frank scored his best-ever Lincoln finish in second, with seventh-starting Jeff Halligan crossing third. Rounding out the top five were Brent Shearer and Ryan Higgins. Heats for the 28 358 sprinters on hand were won by Jeff Rohrbaugh, Kevin Nouse, and Higgins, with Cody Fletcher winning the consolation. Former Lincoln thundercar driver Fred Cullum outdueled Bryan Green in a race-long battle to claim the win in the 20-lap All-American Outlaw feature. Green actually sneaked in front Cullum as the two raced through lapped traffic in turns one and two at the mid-way point, but Cullum reclaimed the lead before the lap was in the books. Third behind Cullum and Green at the finish was Fred’s son Justin Cullum. Heats for the 13 All American Outlaws on hand were won by Brad Alexander and Fred Cullum. This coming Wednesday night, May 18th, the World of Outlaws come to Lincoln Speedway to take on the Pennsylvania Posse in the “Gettysburg Clash”. Time trials get underway at 7:30 PM, with pit gates opening at 3:30 PM, advance ticket holders 3:45 PM, and general admission at 4 PM. Lincoln Speedway will then be dark next Saturday night, May 21st.